School tours, like all Nebraska Capitol tours, are free of charge. A fun and informative virtual tour Explore the STATE CAPITOL is available for students. The Nebraska Unicameral Legislature has valuable information for teachers and students on their website. School bus parking is available on the street one block south of the Capitol (G Street) and west (14th Street) of the Governor’s Residence. School tours usually last 50 - 60 minutes. 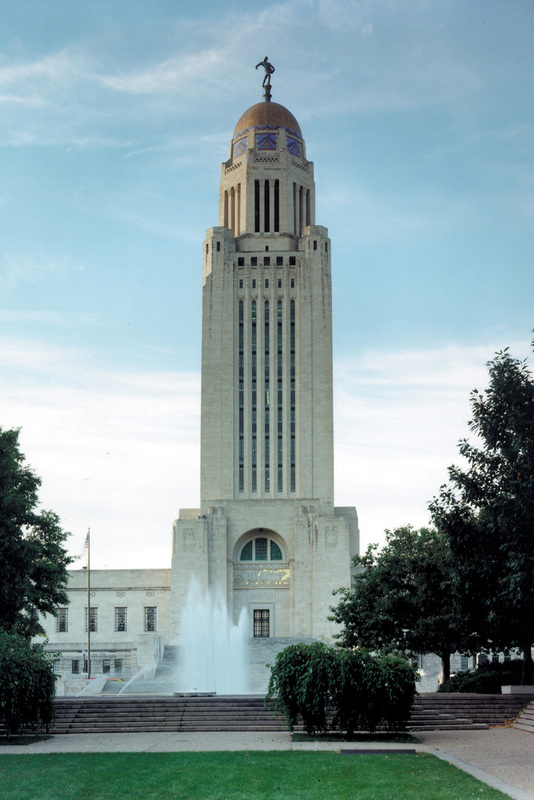 While at the Capitol, groups learn about the Unicameral Legislature and may visit the Legislature in session (add 10 - 20 minutes depending on group size) and/or visit the observation deck on 14th floor (add 20 - 30 minutes depending on group size). The Landmark Store on ground level welcomes students, in groups of ten, with adult supervision (add 10 - 30 minutes depending on group size). School groups with limited time may purchase History to Go bags for students in advance of their visit. School groups bringing sack lunches eat outside in the Capitol Courtyards or across K Street on Centennial Mall. The Capitol Grille which operates the dining room in the Capitol may be contacted at (402)471-7748 about catering sack lunches for visiting school groups. Please call the tour office with any questions about eating lunch at the Capitol. The north tower elevators (northeast and northwest) provide access to the 14th floor observation level and the Memorial Chamber. The elevator doorways are 28” wide and will allow access for many wheelchairs. The exterior observation decks are three steps below 14th floor level, however it is possible to view the city from the door opening. For those with special accessibility concerns the Tour Office has a videotape showing the view from the 14th floor observation deck available. Rest rooms are located on ground floor in the four outer corners of the building, and on second floor in the outer northwest corner. There are drinking fountains on ground floor adjacent to the rest rooms. Tours of the Governor’s Residence are available on Thursday afternoons. Please call the residence at (402)471-3466 for more information.